As if in response to the depression I expressed in a previous post about the pathetic size of newspapers these days, an article in The Gainesville Sun on the new large-screen Kindle Deluxe that’s set to release this summer designed for textbooks and newspapers caught my eye. I’m not one for keeping up with gizmos and gadgets, but this particular device has me interested because it affects print media, and therefore, perhaps my own fate in the near future. 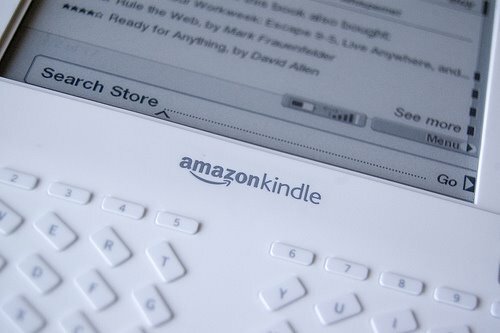 The new Kindle DX (price: $489) will allow consumers to subscribe to even the most prestigious papers –The New York Times, The Boston Globe, and The Washington Post — at a reduced price. Already, users can access 37 papers for just ten bucks a month. Pretty sweet deal for the readers if you ask me. Some may say it still seems like the newspapers are selling out, offering their papers for a lower price to be viewed electronically. After all, how is that any different than viewing the articles online? Well, the Kindle delivers the news without ads. When I was at The Hindu, Managing Director N. Murali told me the problem with most papers right now is that they have relied too heavily on advertising instead of subscriptions, but if they were to change their strategy, perhaps they wouldn’t be seeing the drastic changes their seeing now. So it makes me wonder: if the newspapers featured on Kindle rely less on advertising revenue and increase their long-term subscriptions through Kindle, will they perhaps increase the revenue generated from subscriptions, thereby allowing papers to…well not, thrive, but at least alleviate the situation? Okay, maybe that’s a stretch, since papers can’t expect everyone to afford an almost $500 toy just to electronically read their morning paper, especially when it’s being offered online for (in most cases) free. But for the Kindle and the newspapers turning to this option, the idea behind it at least seems smart…although the outcome would still remain the same as newspapers completely shifting online: a paperless society.